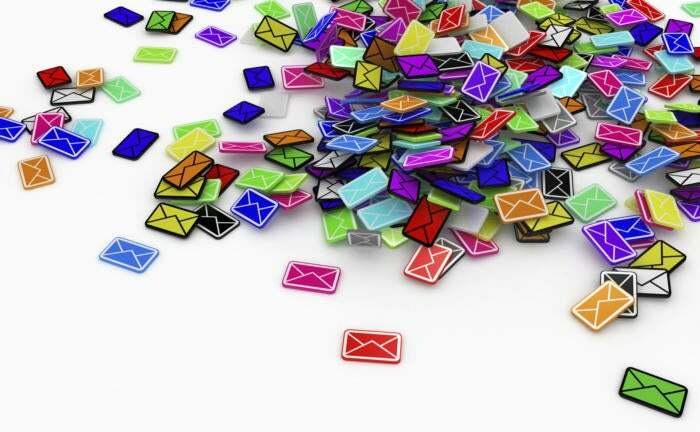 Use these services to get rid of unwanted messages and reclaim your inbox. We are often our own worst enemies when it comes to cluttering our inboxes with unwanted email, thanks to our zeal for email subscriptions. And in this time of heightened civil activity, many of us have added political emails to our already unwieldy collection of daily deals, newsletters, and alerts. The bulk of these messages languish in our inboxes unread and obscuring the really important one that require our action. Fortunately, there are a few tools to help you prune these offenders without having to scroll message by message through your inbox. Give one of these a try. This free service uses a simple web interface to surface all your subscriptions and let you unsubscribe from each with a single click. 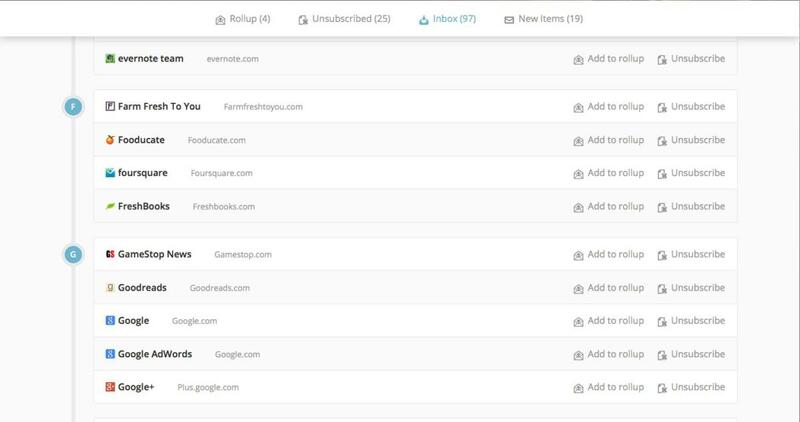 Unroll.me displays all your subscriptions and lets you unsubscribe from each with a single click. Just go to Unroll.me and sign in with your Google, Yahoo!, Outlook, or AOL account (if your provider is not one of those, you can sign in with your email address). Unroll.me then displays a list of all you subscriptions with three options next to each one: Add to Rollup, Unsubscribe, or Keep in Inbox. Click the Unsubscribe button next to each one you no longer want to receive. Inevitably there will be some subscriptions you want to keep. In those cases, click Add to Rollup to have them added to a daily digest of newsletters to be sent to you each morning, afternoon, or evening. Rollups can be viewed as a list or grid, and you can add or remove subscriptions from them at any time. You can also opt to have Unroll.me notify you monthly of your new subscriptions. 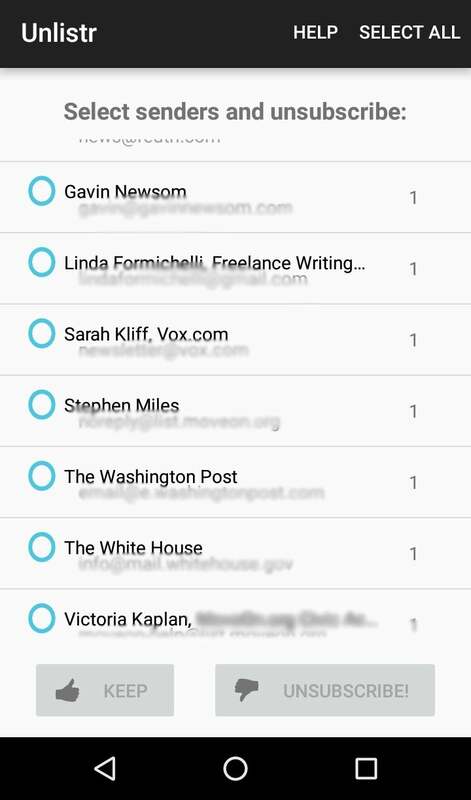 Unlistr lets you keep or unsubscribe to email with the push of a button. Similar to Unroll.me, Unlistr finds all your email subscriptions and allows you to easily opt out of them on iOS, Android, or in Outlook. Once you sign in with your email account, Unlistr asks you to choose an inbox or folder to clean up. It then scans that selection and presents you with a list of senders. For each one, you just tap the radial button next to it then select either the Keep or Unsubscribe button at the bottom of the screen. Be sure about your decisions, though, as Unlistr warns that any subscriptions you “keep” will be ignored in future scans. 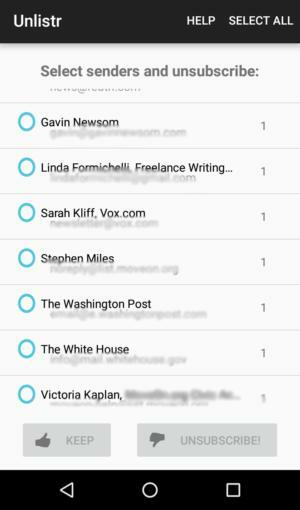 Unlistr is free for iOS and Android but requires a $20 annual subscription for Outlook. With Unsubcriber, there’s no new app to download or separate interface to use. It allows you to unsubscribe from senders from right inside your email client. Email senders added to your Unsubscriber folder are compiled in a list on the Unsubscriber website. Once you sign in on the Unsubscriber website with your email account, this service adds a new “Unsubscribe” folder to your inbox. Just drag unwanted messages into it, and those senders won’t show up in your inbox anymore. The process is similar in your mobile device's email app. All the email senders in this folder are compiled in an Unsubscribed list on the Unsubscriber website, from which you can resubscribe to any email. Unsubscriber is free to use.